"Now if ya really want to watch some h ockey, ya better catch those Kawartha Komets out of Peterborough. The Petes aren't the only attraction there. The Komets are catching some rave reviews. It's not rock 'em, sock 'em hockey, it's even better. 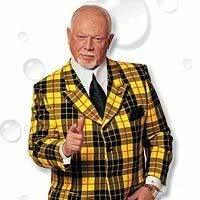 Take it from me, Don Cherry." NO, Don didn't say that but if he knew about the Komets he'd have some great things to say. Maybe I'll tell him a bit about us. 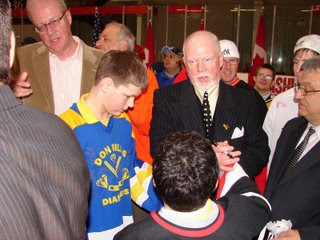 He's met our son Matthew before (see picture) at the SHI Tournament. Stay tuned. We might have a visit from the Coach's Corner...soon!